Music has been part of human culture since its beginning as an easy way of expression, healing and to get people connected. To make this possible, the first tools or musical instruments were just the voice, body percussion and some sticks, bones and stones, but through history human creativity allowed the appearance of more sophisticated instruments which can be used to make more complex and varied musical artworks and evoke specific feelings and states of mind like joy, sadness, love and also quietness. For this last use, Indian and Tibetan culture have passed on to the world several instruments and wisdom about how music can be used to heal and expand our consciousness. Nowadays, Tibetan singing bowls, gongs and bells are still used for meditation and also for diverse music therapy processes around the world, as they bring our mind closer to our true identity and origin as human beings. These wonderful effects come due to the simplicity of the sound produced by these artifacts, which emulates the primal sounds ever existed or ‘OM’ and its echoes in the Universe. Listening to them passively (by just hearing them) or actively (playing a bowl by yourself) stimulates a synchronization of your body and the electromagnetic field to resonate with them, as these instruments emit balanced or ‘harmonic’ sounds with a constant frequency. We could say that regular or popular music is made with more complex instruments as a way to create and express new ideas and feelings about what our minds are filled. On the other hand, meditative instruments remind you that to be happy you just need to be yourself and their sounds bring you back to that neutral state in contact with your Soul and that mental ‘Void’ meditation brings. The purpose of playing or listening to a Tibetan singing bowl is to become one with its sound, introjecting all its energy and peace. Another difference in this kind of instruments is that they let us remember that we are vibration. Every single cell of us is a resonant entity and with singing bowls, we can meditate on feeling that reality, visualizing every single cell absorbing the healing power of the instrument played. At least 11 minutes of peaceful Tibetan Singing Bowl music is a really handy resource to find calm and peace. In case you practice yoga, you can use this specific type of music during your Savasana or meditative relaxation. Listening to these instruments is also a good friend to improve focus during work and study, or at least having a meditation at the start of the day to bring clarity to your mind. The way you play Tibetan Singing bowls and bells is an expression of your identity. Every person emits a particular and unique sound. That sound will vary depending on the mood and subconscious intentions of the player at the moment and the energy of the place where it’s played or where it has been stored. The effects they produce on the place where it’s been played will get increased including the cleaning effect on rooms and houses. By practicing how to play them better (as well as gongs and Tibetan bells) you’ll become wiser about yourself, improving that Meditative state of Mind in your life. In case that Meditative mind gets weakened, you’ll remember how to recover it by playing or listening to them for a short while. There’s another way to get healed with this wonderful instrument. It’s a passive music therapeutic method where Bowls of different sizes and materials are used with the patient to heal specific health issues. Depending on the problem to treat, bowls may be set over specific parts of the body (like upper chest, hips, over the stomach) or close to it at the sides and get played by a trusted therapist. It’s important that, in these kinds of therapies, the purity or health of the healer sometimes is more important than the intellect, but this specific method for the therapeutic application of Tibetan bowls may have really deep effects in the organic functions of the patient and, in case of serious problems, it should be applied by a serious professional only. 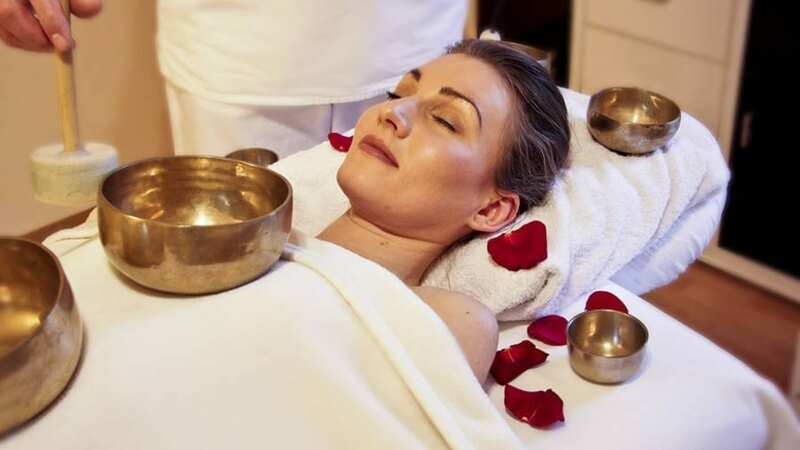 In case you’re alone and want to find a similar (basic) benefits you can just use the music of Tibetan singing bowls, lay down, get relaxed, and visualize its sound resonating in the body part or system you want to heal. Is its sound so nice that you would like to ‘eat it’? Well, it can be done in a certain way. As the mouth and the whole skull s a resonant cavity, once we play a Tibetan singing and learn how to play them continuously, we can bring it in front of the mouth to feel the sound inside of it and the effect it produces. We can start to turn the bowl constantly and feel the projection of the sound to different parts of the oral cavity. Even for kids, it could be entertaining, as the echo from the mouth returns out funny different sounds!